Van rentals, convertibles, luxury cars, SUVs and sports cars are some of the most popular & highly rented categories in the Tampa. Rent a car for Tampa in just three quick steps - search, compare, reserve! Cancel your Tampa car rental for free, up to 48 hours before the pickup time. What are the Benefits of Renting a Car in Tampa with USA Cars Rental? Rent a car in Tampa and take your family on a fun outing & since a trip to Tampa is all about adventure and experience, you can also go backpacking to the remote areas. The city binds together abundant opportunities for indulgence that can be best experienced when commuting via car. Booking a car rental for Tampa in advance to your arrival here not only adds to traveling convenience but also makes traveling far more affordable. Via this trusted online platform, we aim to provide you with a wide selection of well-maintained cars available for direct pick-up. USA Cars Rental provides you with a secure online platform to search, select, compare and book the best of car rental deals for Tampa online. Our affordable car hire services are all-inclusive of multiple rental advantages. Touring Tampa is a roller coaster ride best experienced in a car. When you plan to rent a car for Tampa online, we strive to provide you with a wide car fleet offered in alliance with top suppliers. The cars are well-kept, insured and are offered at cheapest-possible prices. The list of our trusted car rental suppliers for Tampa consists of names like, Alamo, Thrifty and Dollar amongst others. Depending upon the supplier chosen, you are provided with the optional facilities such as- additional driver, child seat, ski rack, snow chains, navigation system, etc. What is the speed limit to drive a car in Tampa? Even though you are expected to drive with the traffic flow, there are a few standard rules for speed limit. These are- 70MPH on rural interstate highways, 55MPH for other roads and highways except for it is mentioned otherwise. In residential areas, it is supposed to be 30MPH, whereas in the school zones it is 20MPH. On the limited access highways, speed can vary up to 70MPH. This information is for guidance purpose, look out for road speed signs and follow what they instruct. Manual or Automatic – Which Car Type to Rent in Tampa? Majority of the times, vehicles having automatic transmission are available. Although at the time of booking, you can confirm the same with the booking support team. Rent a car for Tampa to experience this city’s magnificence at the many notable attractions. Online car hire gives you privilege to travel to any place of your choice ranging from Theme Parks to Botanical Gardens. Settled sometime around 19th century, the city owes it major economic boom to cigar industry. Today it is the most frequently visited holiday destination. On a trip here, you can indulge in perhaps every activity that you ever imagined, inclusive of excavating the fossils or taking a stroll down the skeleton museum, visiting the dinosaur museum or eating lunch in a cave. For the first-timers, Dinosaur World is a theme park wherein you will find many life-sized dinosaurs. As for the regular drinkers, Blue Martini is one place you surely do not want to miss. This happening place provides over 25 different martinis and drinks based on unique concept. Dig deeper down the city and there are many more opportunities for indulgence within the city’s neighborhoods. Why Rent Your Tampa Car with USA Cars Rental? By comparing & booking a car rental for Tampa from the best of brands online at USA Cars Rental, you can have a safe and enjoyable tour in and around the city’s fun locales. We give you access to a leading car booking portal. With a simple three-step process of ‘Select-Search-Book’, our online space makes it easier for travelers to get booked car rental in Tampa well in prior to their visit here. Our car booking engine is easy to navigate and SSL secured, includes varying car rental inclusions and available 24/7 for booking car rental in Tampa and all over US. Our car hire solutions are not only reliable, but pocket-friendly too. In case of queries, customers can connect with our friendly team for the much needed support. Earlier residents of Tampa included Tocobaga and Phony. If you are a history buff then you can drive down to the various places of interest such as the campus of the University of Tampa. Another fun sight to be included in your itinerary of must-visits is the Gasparilla Pirate Festival. Held every year since the year 1904, the parade is meant to honor the life of Jose Gaspar and his band. If here on a short stay, make sure you do not skip Lowry Park and Busch Gardens that are known to the World as the gems of Tampa. The latter one is not just another theme park. It has one of the fastest screamers in Germany. Exploring Tampa- The Other City Highlights! This city attracts visitors from World over, both for leisure activities and for business trips. Therefore, three major international airports serve the city including Tampa International Airport (TPA), St. Petersburg-Clearwater International Airport (PIE) and Sarasota-Bradenton International Airport (SRQ). If expecting a fun time shopping, then the opportunity is not far behind. Acquire your pre-booked Tampa car rental and drive down to La France, RareHues or International Plaza and Bay Street amongst other notable places. Being in Tampa is all about adventure as the city has lively settings. The Bok Towers Garden, Fort DeSoto Park, Clearwater Beach and Caladesi Island Park are three eminent beaches to head to on a quaint holiday. Perfectly complementing the serene white beaches is the adventures experienced kayaking clear waters of Tampa Bay. The wildlife along Hillsborough River is worth catching a glimpse of, if you have spare time. Plan your trip to Tampa ahead of time, book a car rental for Tampa and make the most of your outing here. Tampa – The City Different Welcomes You! Plan a memorable stay in the ‘city different’, by pre-booking car rental for Tampa online at our simplified booking engine. Economical deals on offer! Located on the West Coast of Florida, its third largest city may be all about business to the World, but its plethora of scenic attractions, wildlife, art, culture and architecture have successfully grabbed eyeballs of travelers over years. A part of the Tampa Bay area, the city houses many high rises which primarily depict post-modern architecture. Primarily showing characteristics of tropical climate, this city has World-class infrastructure. Healthcare in this city has been ranked amongst some of the best in US, which is accompanied by state-of-the-art infrastructure. The city attracts visitors from World over, both for leisure activities and for business tours. Thus, besides the general aviation airports, three major international airports serving the city include- Tampa International Airport (TPA), St. Petersburg-Clearwater International Airport (PIE) and Sarasota-Bradenton International Airport (SRQ). From art to adventure, shopping and sports, touring Tampa is lesser of a vacation and more of adventure. The Bok Tower Gardens, Florida Aquarium (for a Dolphin cruise) and Tampa Bay History Center are the three prominent landmarks to be part of your first installment of a trip around the city. Heading further, the nature lovers can escape to Hillsborough River for paddling adventures and canoeing both by yourself or when accompanied by family. The city offers shopping and dining at its best in the entire country. So, if you are willing to shop like there is no tomorrow then lead your way to La France, RareHues or International Plaza and Bay Street, to name a few in this long list of amazing shopping circuits. If there is still some time left, then adventure seekers must not skip the Speed Boat Adventure Tour for an experience of lifetime. Minimum Age to Rent a Car in Tampa: All the drivers aged 21 years and above can rent cars in Tampa; make sure that you are providing your right age at the time of booking for if found underage at the time of pick up, the supplier can refuse you the rented vehicle. Read the deal specific T&Cs for current information as these conditions tend to change with time and sometimes suppliers even quote different age requirements for different car types. What Documents Do I Need to Rent a Car in Tampa? : A valid driver’s license (DL), a credit card, and an Identification proof, preferably your passport. You will need your international driver’s permit or the official translation of your driver’s license if your DL is not in English. Can I rent a car in Tampa without a credit card? : Since most of the car rental companies need to block a security amount at the time of pickup, they make credit card the mandatory document. Though some of the agencies allow payment through debit card or cash, they are provided only for selective locations. In case you don’t have a credit card, you can use someone else’s card and get yourself added as the additional driver (if you want to drive) as the booking will be made in the name of the card holder. Florida Aquarium: – For the admirers of marine life, this is the finest of all places to peep through glass walls at water animals, when on an excursion to this beautiful city. Bush Gardens: – An amazing mix of enthralling rides, a premier zoo with thousands of animals, shops, and more. Tampa’s Lowry Park Zoo: – The topmost zoo in US, this one exhibits over 1000 different animals and opportunities to get closer to them. It has groundwater play areas as well. Adventure Island: – The place is all about water-sopping fun! Slides, thrills and relaxing surroundings. 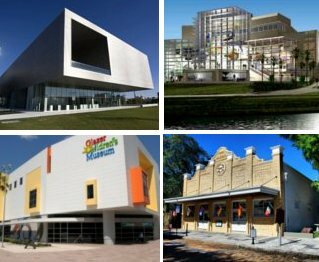 Tampa- The Haven of Museums! Tampa Museum of Art The museum building houses six galleries that exhibit splendid Greek & Roman antiques and photographs. Tampa Bay History Center The pioneering history museum showcases cartography collection dating back to six centuries. Glazer Children’s Museum This interactive museum provides a unique play space for little kids under the age of 10. Ybor City Museum State Park It is a urban park and historical museum in the heart of Tampa.